Invited friends over to demo the game today! They got to try out the start screen and the beginning section in the cave. I'd designed for a seated experience, so when they went to light the lanterns which were close to the ground, some of them tried to reach down without crouching, missing entirely! We definitely noticed little things that can be improved! This week has been super productive, and it's exciting! The start screen has been sorted out with gaze-triggered events to start and exit the game. I decided to focus more on designing and capturing the mood and lighting of the scenes, over detailed modeling and texturing environments. Here's the starting zone with a distant gate and some old shrine rocks. 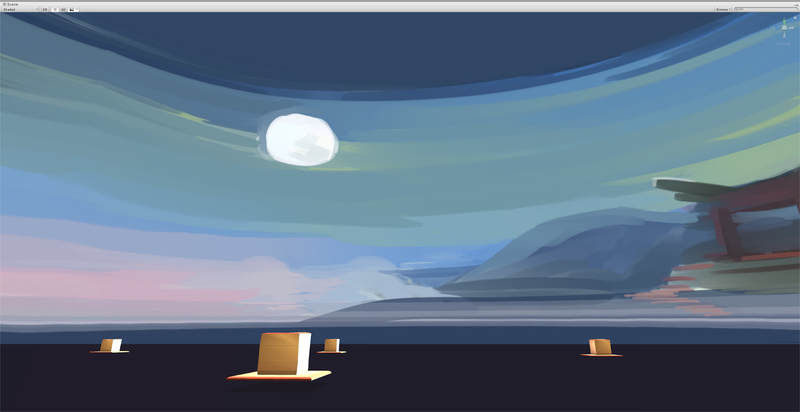 The light-emitting rock was really effective in drawing in the player to looking at it! It'll definitely be used in more places in the game. My programmer teammates have been working on getting the boat pathing to move smoothly, and on creating a system to let the lanterns follow the boat in a beautiful way. 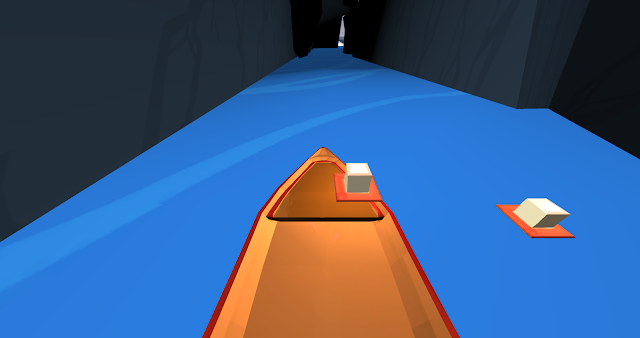 The boat's movement can now be activated and deactivated by the player! We had a lot of fun working together this week, and tossed around the idea of meeting up in the future to do an in-person jam. Looking forward to the last couple weeks of development (and a short break for PAX)! We have the plan for the story arc for the demo locked down, with very clear interactions that will be demonstrated. Onwards, to continue building! Started building a lot of stuff this week! Went into blender and built out a boat and a torch for the player to use, and then put it into Unity! I had a lot of fun seeing things come together in the game engine. The OVRCameraRig was easy to get started with. 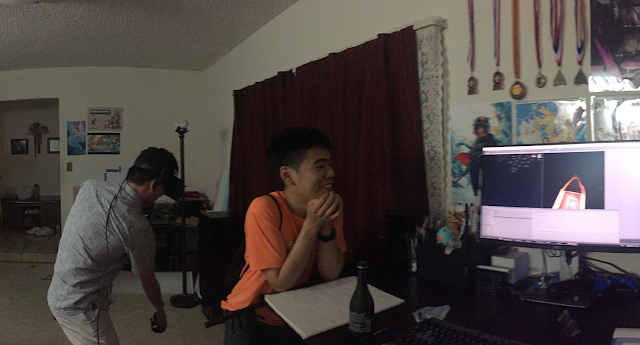 And then testing my scenes out with the oculus rift was awesome! Getting one has sped up development a lot, because the game can be tested immediately! Most exciting part of this week was getting the water to animate ! The Oculus feedback for the demos have been super helpful. Reviewing the notes for last Friday's conference call, too! I've been keeping the advice in mind while working. This week a couple of my friends pitched in to help with the programming side of the project. As developers with experience in VR, they listened to the lanterns idea and then expanded on it with great insight and ideas! One of those great ideas was to add a physics-based interaction into the game, a torch that will let the player feel like they're touching the lanterns. I'm really excited to try out this new idea in the Oculus. With a team I have also found the need to narrow down and express my ideas coherently, instead of having a nebulous concept in my head that is only explored when I'm creating the art and models. I've started on a 'user story', intended to guide the team towards creating the magic of lanterns.
" You start in a cave. It's dark and you can't see very much. Looking around, there's a torch, which you pick up, and an unlit lantern to the side of your boat. Striking the torch against the lantern lights it. It ignites and comes to life. You're in a boat, moving slowly forward. As you exit the cave, your view opens up to the river. There's many more lanterns strewn across the water. You lean gently left and right, lighting the lanterns along the way. They spring to life and dance across the sky." Put together a model of a lantern this weekend, and also got the Unity project building to the Gear VR. Celebrating this minor success! It's a completely different feeling viewing this inside of the headset! I had to tackle a lot of 3D processes, such as how to make a skybox, model, and texture. 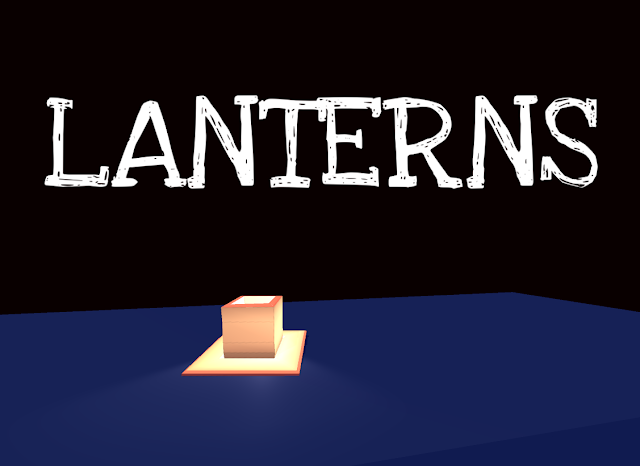 The lanterns, and eventually the level itself, are being created in Blender. I'm amazed at the in-VR-art that others are creating, it really adds that hand-crafted feel! My quest to try out Quill on the Oculus begins! Lighting the lanterns has also been a bit challenging, especially when it comes down to the minute changes in each setting. Preliminary lights on the lantern had me put 5 spotlights on each one to light every side (including the inside). Progress has been made! My goal for this demo is to build out a prototype of the first chapter, and have lots of great interactions with the boat and lanterns for the player to act out! Getting the blocky outline of the starting area gave me a better idea of how large of a space the boat is going to move through. 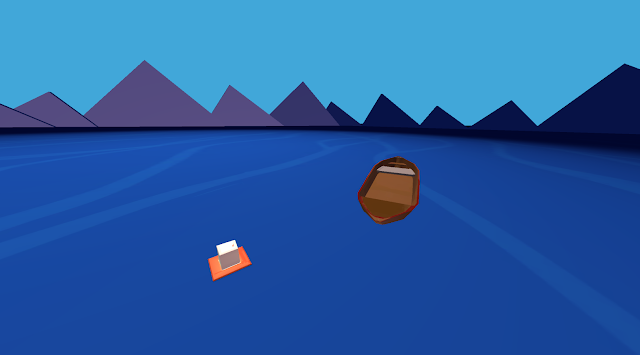 Given the speed of the boat (it's going to move very, very slowly), it'll be a couple minutes of gameplay.